I first met Donovan Leitch sitting with Mal at the table by the cliff. He was twenty-one, soft-spoken and friendly. He had an interesting face, long and rectangular, with a shy, almost internal smile. He told me he’d always been a quiet and introspective person. At fourteen, he read about Zen in Jack Kerouac’s On The Road and became interested in the psychological and spiritual path of Buddhism. “It appealed to the bohemian in me,” he said. Brought up Christian, he accepted Jesus’ “Kingdom of God within. But how do you get there?” Later, he thought meditation might be the way but felt that meditation had been lost in the Celtic-Christian tradition. Then his friends, the Beatles, got interested and he, George and Pattie were talking about spiritual things all the time. He was taught meditation by the Maharishi in Los Angeles and when he got back to England he and the Beatles were invited to the ashram. Donovan and the Beatles had been good friends for a long time. He had written Sunshine Superman in admiration of them and they often attended each other’s concerts. 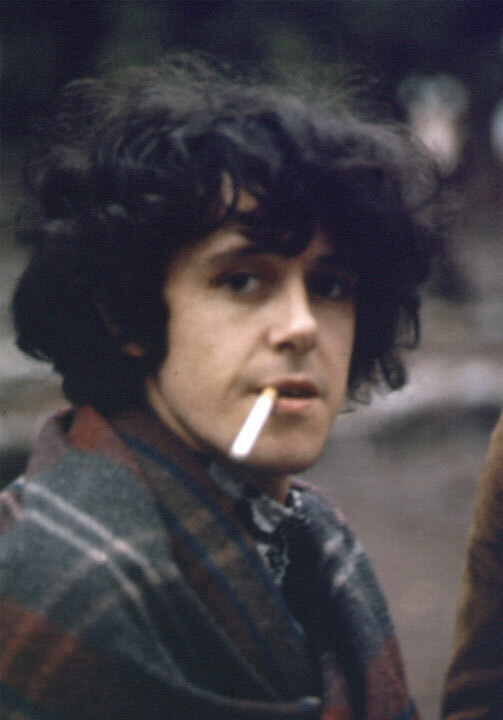 Donovan was about 17 years old when he first heard the Beatles on the radio. It was Love Me Do and without knowing who they were he says, “Something clicked in me: The acoustic guitar, harmonica, drums, bass and Celtic harmonies, because that’s what the Beatles had in their first song—a Celtic sound.” Twelve months later he was sitting in the same room with them. Bob Dylan introduced them, in a darkened room in Dylan’s suite at London’s Savoy Hotel, the only light coming from a figure skating competition on the television. It’s a marvelous story and one best enjoyed in his own poetic words in his new autobiography. What he knew instinctively, from the start, was that they were on the same journey that he was. That evening, as I was walking to the front gate, I met Donovan and Mia heading the other way. It was chilly and almost dark, and Donovan had a colorful blanket wrapped around his shoulders. A cigarette dangled from the corner of his mouth, which was a bit risqué since cigarettes were banned from the ashram. Mia was wrapped in a brown Kashmiri shawl, cuddling her dog, Arjuna, his head nestled in her right hand. I took several pictures of the three of them. By then there was so little available light I just set the camera speed as low as I could, opened up the f-stop as wide as it would go, and hoped something would show up on film.